It’s been almost 2 years to the day since I’ve published the interview with my friend and Twitch streamer Ian aka Eboy87. A few days ago he did his third 24 hour charity stream and I decided to catch up with him afterwards. You can listen to the entire interview or you can read the transcript below and watch some clips from the stream. Follow Eboy on his Twitch and on Twitter (@EBoy87Gaming). Go check out his merch as well! Main banner artwork is by Veronica. Hey guys, it’s 2nd April 2018, it’s Easter Monday and I’m sitting down here with my friend Ian, also known as Eboy87 on Twitch. Hey Ian! Thanks for agreeing to this interview! Eboy87: No problem, thank you for having me. So, time flies and it’s been over 2 years since we’ve done this. What has happened for you and your channel since then? Eboy87: Quite a lot really, I mean, if we look at this one from a couple of years ago and I was at about 280 something followers, so I think the biggest thing that’s changed since then is that number, ’cause we’ve just got about, we’ve hit over a 1000, we’re now at 1026 followers, so that’s nice. That is cool. The stream itself visually has changed, y’know, we’ve gone through different overlays and stuff like that, so yeah, it was quite nice. And also I’ve been added to Twitch’s affiliate program, so I’m now an affiliate which is like a kind of pre-partnership type of thing the way I see it, so people can cheer with bits and stuff like that and they can also subscribe to me as well, which is quite nice. Eboy87: Hmm, I thought so. So you’re happy with the channel’s growth? Eboy87: Very, I mean, I don’t stream incredibly often, so I think given the amount of time I stream versus how long it’s been, the growth’s been pretty steady, we can’t honestly complain. I mean, maybe if I streamed every single day we might be further along but obviously I haven’t got the time to do that yet, so yeah, I’m more than happy with how it’s progressed. That’s awesome. Congratulations, by the way! Eboy87: Thank you very much! So, yesterday you finished your 24 hour charity stream, how are you feeling? Eboy87: Surprisingly awake now. (chuckles) Well rested, definitely, but yeah, I feel good in terms of how it went, the money we raised and everything, so it was a nice experience. We had a few nice moments during the stream which I’ll probably expand upon later but yeah, feeling good! Can you tell us about what the cause was, why did you decide..? Eboy87: Yeah, of course! So this year I did it for MacMillan Cancer Support, which I think is a UK charity, it might be global, I’m not too sure. I didn’t do my research, bad Ian. (Editor’s note: it is a UK charity) But yeah, it’s a charity that helps people with cancer, funds research and such but they also do a lot of support work for the families and not just the people who are suffering the disease but also the families as well. The last two years I’ve done it for Cancer Research UK, I know they’re global because they’re in different countries and whathaveyou. This year I decided to do it for MacMillan Cancer Support instead, mostly because the last couple of years doing it for Cancer Research UK, it was because I was taking part in their 24 hour event The Relay for Life. It’s a 24 hour relay around the track with teams and we’re all raising money for cancer research. But because I’m not taking part in that event this year, I figured that do it for a different charity but obviously I wanted to keep it as a cancer charity. It’s a disease which affects, I think, pretty much everyone. They’ve had some kind of experience with it, whether it’s been themselves or a family member that’s had it or unfortunately died from it. If we’re talking about why I do it personally as well, it’s because not long after meeting my now wife, Kayleigh, I was diagnosed with testicular cancer back in 2009. Luckily we caught it early enough, we got rid of it and I’ve been clear ever since but of course, not everyone is as lucky. It’s nice to try and raise money to help out people that are still suffering and the families that are suffering as well. So this was your 3rd charity stream of such magnitude, how do you feel it went compared to the other two? Eboy87: That’s an interesting question, I was looking forward to answering this one. Because in terms of…if we’re talking in terms of pure numbers compared to last year moneywise, it’s a step down. Compared to my first year it’s a step up, so the first one I did back in 2016 not long after we’ve moved here (editor’s note: new house), I think the final total was something in the area of £220, something like that which, again, I was more than happy with. Yeah of course it’s your first one. Eboy87: Yeah, it was my first one and also given the size of the channel at the time, 280 followers I think that was pretty good going. Last year, unfortunately I can’t remember how many followers I had this time last year, it was more than the first time obviously but not as much as I have now. Last year I had a community that I was part of that also a couple of days prior to my 24 hour stream a load of those streamers streamed on my behalf and raised money on my behalf. So the total last year when I’d finished with my 24 hour stream on Satuday, which was kind of like the finale of the whole event if you like, it was 2200, 2400 odd pounds we’d raised, which went to, as I said, to my relay team for the Cancer Research Relay for Life. So that was absolutely amazing but then this year I kind of did it on my own, so to speak, so I was the only one streaming for it. 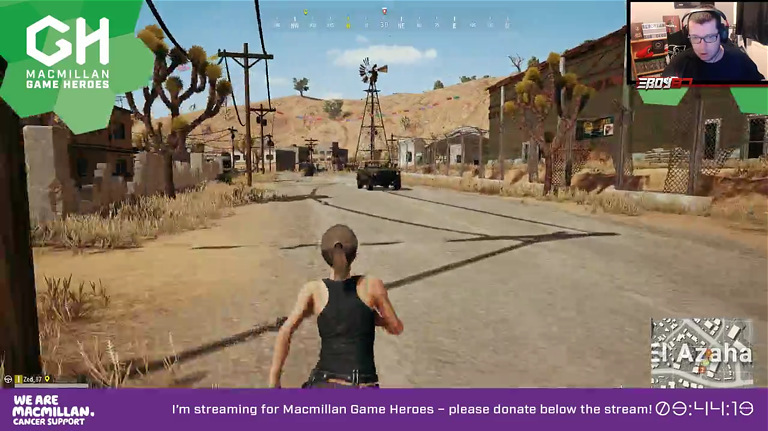 I did have communities behind me which were amazing with their support, they were sending people over, I was getting hosts and raids and a lot of new followers but most importantly we were getting some really generous donations from people that were coming in and we raised… £447.21 was raised and I’ve actually got a little bit to add to that cuz I’m gonna add the value of all the – cuz I got a few cheers and bits at me as well so I figured I’d add them to the total. So once I’ve been able to add them, I can update the final total but I think it will still be somehwere in that area. Again being that I was the only one streaming for it I’m incredibly happy with the amount of money we raised and it really made me feel a lot better because I was feeling very nervous about it purely because like I said last year I had a whole team streaming for me and we raised so much money, this year I was a bit kind of..uhhhh I’m on my own, there was no way I was gonna raise that much but I was also worried that I wouldn’t raise maybe even as much as I did the first time round. So to raise that amount of money was amazing. I’m really happy with that. And in the end any amount is great for a charity. Eboy87: Exactly, yeah, it’s important not to try and get too hung upon on what you raise. But y’know, we’re all human, we worry, we can’t help feeling a bit worried about it but no, in the end I was more than happy with how we did. Yeah it was a great stream. Eboy87: It was. It was. So when you look back on it now, like one day after, what’s the most memorable moment from the stream? Eboy87: Ha, I think you know the answer to this one. (chuckles) So basically you had introduced me to another twitch streamer that you’ve been watching…am I okay to say his name, aren’t I? We can get him a name drop! Eboy87: Jason Sullivan, (I’m sure Dana will probably work some kind of link for him into the article or something somewhere) but he’s such an amazing guy and for me personally he kinda came out of nowhere, I mean, I’d never heard of him before. But anyway, Dana kinda introduced me to him, so I’ve been going to his streams and like I said he’s such an amazing- he’s so positive and he has such good energy about him, his streams are amazing, y’know. 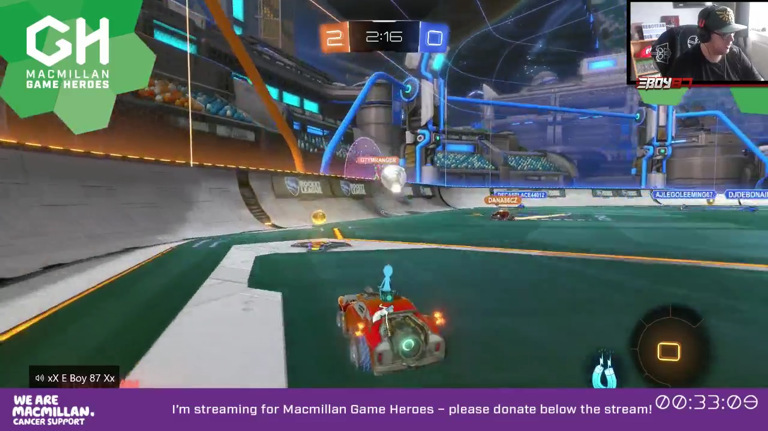 So I’d been connecting with him and I’d been talking to him and I’d asked him if he maybe wanted to come and play some games with me on the charity stream. In the end he wasn’t able to play because he had real life commitments but he did come in to my stream and I think he must’ve spent a good half hour or maybe an hour in my stream just chatting and talking to me. So that, y’know, that made me feel really good and also a few of his followers came over to my stream as well, which was nice to see. A couple of them even donated as well, which again is awesome cuz it’s all going to the cause. But it was really nice to have him there. It definitely helped me maintain – I mean, during the early hours of the morning when I was usually getting into the stage where I was kind of starting to really get tired I was just so happy with how had it all gone and especially having Jason coming to the stream and talk and whathaveyou just made me feel really good. So I’d say that was definitely, definitely the main highlight of the stream for me. I agree, actually. I think that wherever Jason goes he always brings kinda like a burst of positivity. Eboy87: Positivity, yeah, defintely. I mean, if anyone ever gets the chance to check him out you should because it’s such a nice stream, it’s funny, the people there are so welcoming, his mods and also his viewers, they’re all really kind. I’ve never been in that stream and it’s never been like anything other than positive, he’s never been down or anything like that, it’s always just positive, positive, positive, which is why I really was keen to try and ask him if he would play some games with me cuz I know if I was feeding off that kind of energy would really help especially when it got to the early hours of the morning. But no, it was amazing, so I’m really thankful that he came over and of course after the stream I sent him basically like a tweet on twitter just to thank him and his followers, the ones that came over to show some support as well. I’m gonna link Jason below as well as Ian’s stuff, social media and Twitch, so you guys can check it out. Eboy87: You won’t regret it if you do, definitely. But now from the not so maybe pleasant part of the stream…have you had some obstacles that you had to overcome before or during the stream? Eboy87: Um, during no, actually. I don’t recall anything, there was no problems that arose either technical or otherwise I guess, cuz those one of the things I’d be worried about, y’know, if something went wrong, y’know, if my internet dropped out or something like that and the stream cut short but no, nothing like that. I guess like I touched on earlier, the main thing was just me worrying (chuckles) about how it was all gonna go down and being nervous about not raising much money and that, but I mean as you so rightly said to me, once you start streaming you won’t eveen worry about it and it’s true I didn’t, once we got into the games and I was playing with people and chatting to the chat, it just kind of went out of my mind, so yeah I’d say that was the only obstacle. We had no trolls or anything coming in, so yeah everything went really well and I’m really happy, in that sense. No major obstacles to overcome. So that was good. That’s good, I kinda was surprised by the lack of trolls. Eboy87: I was! But it’s bad that we feel like that, isn’t it, like we go “oh god, there’s gonna be trolls” but it’s…y’know, if it happens, it happens, I’d have trusted my moderators that were in there to be able to deal with it quickly but no, it wasn’t. So, winner winner! We might have some aspiring twitch streamers in the audience. You’ve given them advice two years ago in my post. Has anything changed in your opinion or would you like to add on to that? Eboy87: It’s probably about the same as last time but I just, y’know, I’d just reinforce that if streaming is something you want to get into, the main thing to do is to just have fun with it. Just enjoy yourself, try not to- I’ve seen it a lot recently with people… I think a lot of people think it’s gonna be an overnight thing, in terms of channel growth and stuff like that, it really isn’t. So it’s, y’know , it’s important to just remember that everyone grows at different rates. I mean, I’ve seen streamers that have put things on social media like “oh a year ago we started streaming and now we’re at X amount of thousands of followers”. And something like that could get you down especially when like for me personally I think well, “I’ve been doing this for 4 years” but then at the same time you have to think well, maybe they can put more time into it, maybe they can stream Monday through Sunday if that’s something they want to do, which does help, y’know, the more frequent you are the more likely you are to get a lot more followers. But just enjoy what you’re doing, build, try to build a community that you’d want to be a part of as well, like i said about jason, I mean, I would…, I think my community is amazing, of course, they’re all like-minded people, they’re all very friendly and it’s the same with Jason’s stream. it’s such an amazing community to be a part of, so build the kind of channel and community that you’d want to be a part of. Exactly. That’s a good advice. Eboy87: Yeah I think so. Just don’t worry too much straightaway about getting all the best equipemnt for streaming and stuff. Use what you’ve got. I mean when I first started it was using the inbuilt streaming function of my Xbox One. I didn’t even have a cam straightaway, it was just purely audio, so don’t think you’ve got to go out and get top of the range equipment and everything straighaway, and a PC and a capture caard cuz I would imagine most people at least don’t have…y’know wouldn’t be able to go and do that anyway. so if you’re Xbox or Playstation, if you can just stream through that, then start off like that and just build your way up slowly. I mean, a lot of my…in fact pretty much all of my early donation goals were all for different things for my stream like a new webcam, a new microphone, a keyboard and what have you. So yeah, Just start and work your way up slowly. and don’t worry too much about having to have, y’know, the best everything straightaway. Yeah. Just keep on growing on your own pace. Eboy87: Exactly! Yeah, exactly! And I think my final bit of information, advice should I say, with regards to stream is, get yourself some good mods as well. Get yourself some good mods that can help, probably people, I mean… my mods for example i.e. Dana and Veronica especially were actually from another stream. I kind of poached Dana, we always joke about this ’cause she literally showed up on my stream, the first time I was like “Ooh, Dana’s a mod in so and so’s channel *MOD*” (laughs). Luckily or unluckily I guess, she stuck around (laughs) and she didn’t go “Uuuh, okay, I don’t wanna be a mod, bye.” and ran off. But yeah, if you’ve got some people, some friends on Twitch that you know and that you trust to moderate a stream then I’d say… but maybe ask them first (laugh). Don’t do what I did, ’cause that was incredibly risky, ’cause I kind of just went OOH MOD. Yeah, it was risky. You’re lucky. Eboy87: I’m very lucky but at the same time it was a good choice, because they’re all, all my mods are good at what they do, they know how to handle the trolls, they know how I like, y’know, how I like them to be handled basically if that makes sense, so get yourself some good mods. You won’t need loads at first, you’ll proabaly just need one. But obviously as your channel grows you can look into adding mroe. Okay, now that you have three 24 hour charity streams under your belt, could you give advice to someone who’s not really sure about doing 24 hour streams? I mean in terms of what to look out for, how they can prepare themselves and kinda like how to keep up their energy levels during the stream? Eboy87: Yeah, I mean if you’re planning to do, I mean I think a lot of people tend to do 24hr streams mostly for charity, I’ve never stumbled across anyone who’s just streaming for a full day for the heck of it. I can’t really say what the best thing is to do but what I do is, I mean, to prepare yourself maybe a few days before you’re planning to, y’know, to do your stream, maybe just lay off gaming or whatever it is you normally do in stream. Maybe lay off of that a little bit ’cause you want to try and you don’t want to be bored of it before you have to start before you have to do a stream for 24 hours and think “I don’t really wanna play any games, I did it all over the last couple of day” so maybe lay off that. Energy level wise, and I guess also in terms of looking after yourself during the stream is plenty of water, plenty of water, stay hydrated, don’t fall into the trap of thinking “oh I’ll just douse myself up on fizzy drinks and energy drinks” because you will crash. You will crash early. (laughs). I know energy drinks do give you energy in a way but obviously if you have too many of them then yeah, it’s gonna get later on in the stream and you’re gonna be, you’re not gonna be in a good shape. And try and give yourself fairly regular breaks, I did mine… I think I gave myself like a 20 minute break maybe about every 3 or 4 hours, it was a bit longer in some cases and y’know get yourself something to eat, again try and keep it as close to a normal meal as possible, don’t just snack on crisps and chocolate and stuff like that ’cause again, the same thing will happen if you have too much chocolate and that you’ll crash later on. Literally as soon as I started, god bless my wife, she brought me up my lunch straightaway, so I sat there and kind of ate that while I was starting and stuff. But yeah, definitely lots and lots of water to stay hydrated, you can always take little bathroom breaks if you need to even if it’s not your normal break time, people are not gonna mind you just have to nip off to the toilet for 2 minutes. If you want to, I found it helped to do a schedule as well for what you intend to do, although this year different to other years I got to the point when I was doing my schedule. I think it got to about 3 am and I thought “darn I just can’t think of what I want to play” so I basically said from that point onwards I’ll just play whatever I’m feeling like at the time. because for me at least I didn’t want to force myself into playing something that I wasn’t really wanting to. because that could obviously affect you as well ’cause if you start getting bored, y’know, especially during the later hours of the stream, you’ll probably start getting sleepy and more tired and you’ll just want to stop. So I think that for me really worked this year because I noticed the tiredness aspect of it for this year for me cracked on a lot later than it has in previous years. Eboy87: Yeah, the last couple of years it got about 3, 4am when I was starting to feel but this year it probably got to about 7 or 8am where I was starting – and I think most of that was because I hadn’t switched to a game that I thought “ugh, I don’t wanna play this”, I just carried on with what I was doing because I was enjoying it. And I think I was playing Sea of Thieves it was after we played PUBG I was originally intending to carry on with that but because there was no one else around to join me I thought “I don’t wanna do that on my own but I wouldn’t mind getting on some Sea of Thieves on my own” so I did that and that helped as well. Like I said, I was still kind of feeding off the positive energy of, y’know, how well we’d done with the stream so far, what we’d raised and also with Jason’s visit as well; I was still very happy about that. So, pace yourselves. Definitely. Lots of water, frequent breaks. You don’t have to be long, I tended to have about 20 minutes or so maybe a bit longer when I had my dinner ’cause we ran over a little bit, but basically pace yourself. Take it easy. And if, honestly, if you ever get to a point you feel you can’t do it, I would say stop. Because if you’ve hit the point where you think “I really can’t do this anymore”, then stop, because you could make yourself ill potentially if you try and force yourself to carry on. Luckily, like I said, I paced myself like that and I think if you do pace yourself properly then you should be okay. But also what helped as well, is I mean, this is a no brainer, but the night before get yourself to bed nice and early. Get as much sleep as you can, have a bit of a lie-in and wake up, y’know, before, not like right before you need to start your 24 hour stream but get yourself plenty of sleep the night before and get a nice early night. You should get through it no problem. You’re gonna feel tired, that was another thing that I said as well, there will be a point where you do feel tired. But as long as you’ve not got to a point where you feel you really really can’t do it, then I think you’ll be fine. Yeah exactly, and I think it also helps when you have people around, whether in real life or in chat or if you’re gaming with them. Eboy87: Exactly, yeah that was good. You can feed off their energy. Eboy87: Exactly, they keep you talking. Again, I had some people in the chat a lot later this year than I have in previous years, so there was people popping in and out and they were talking to me. And yeah, like Dana says, that does really help, because it keeps you active. Y’know, you’re responding to what they’re saying. Obviously you can’t expect your viewers to stick around for the full 24 hours with you but, I mean, like yourself what did you get to, about midnight – well it was probably later than that for you, it was about 1 o’clock. Yeah about 1 o’clock I went to bed. Eboy87: Yeah and then you came back the next morning. In between times if you’ve got people in your stream or even if you haven’t, try and just to chat about what you’re doing cuz there might be people lurking in the background that haven’t said anything and if you’re just talking and keeping it interesting that might prompt them to maybe pop up and say hi and strike a conversation with you. Then you’re doing good, yeah. And you’re not falling asleep when you don’t speak. Eboy87: Exactly, I did speak about this on my stream. I think my first year I did have a part of my stream when I was literally nodding off because I was playing, I remember I was playing Deadpool and again, it must have been about – it was definitely between 3 and 6 in the morning. And I just remember sitting here with my controller and I was playing Deadpool and I thought, I felt like I’ve drifted off and when I kind of like looked up I noticed that I was making him fall off the edge of the map and he kept dying and respawing so I was like oh god. But again, if you do feel like that take yourself off real quick, maybe splash some cold water on your face, go and get a little bit of fresh air if you can especially at that time in the morning ’cause it’d probably be pretty cold so that will wake you up as well and help keep you going. And you also answered my last question, which was, if there are instances in which you would recommend against prolonged streaming like this? Eboy87: Yeah exactly, if you’re, honestly… everyone knows their own body and if you honestly get to the point where you feel you can’t do it, don’t, just stop, because there have been some bad instances in the past with I believe one streamer actually did unfortunately die but they’d also been doing like, as far as I can remember, they’d been doing a amarthon of like long streams like on consecutive days so they’d had literally no sleep and I think their body just gave up on them. So like I said, plenty of rest the night before, space it out, lots of water, frequent breaks but if that honestly that’s not enough and you feel you can’t carry on, just stop, people will understand. Yeah, listen to your body. Eboy87: Yeah, listen to your body. Don’t try and push yourself, if your body is saying no then just stop. Yeah. Okay thank you so much Ian for taking the time to do this. Eboy87: You’re welcome, it was fun. Thank you for having me. Okay guys, if you wanna check out Ian’s channel, all the relevant links are down below, Also there are his social media links so make sure to give him a follow. We’ve talked a bit also about Jason Sullivan so I’m gonna throw down his Twitch link and also his social media links. Do give them both a follow because they’re just amazing streamers, amazing people. Their streams are always fun, their communities are so friendly, so welcoming and I think that you would feel right at home. Now while you’re on a following spree make sure to follow me, Dana at Geekygamingstuff on Facebook and on Twitter (@geekygamestuff). Love you guys, see you next time! Do you have any questions for Eboy? Let us know in the comments below!